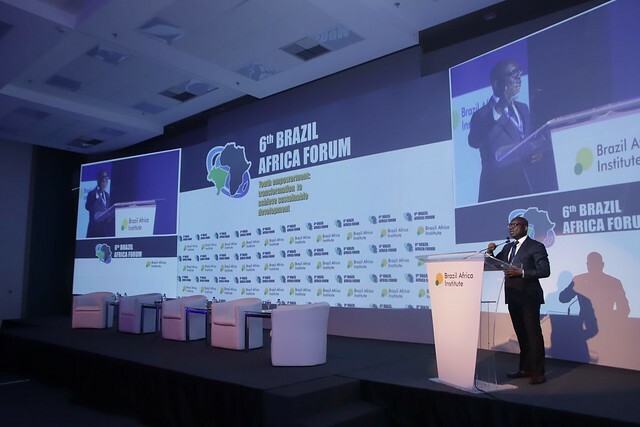 The President of the Consultative Council of the Africa-Southeast Asian Chamber of Commerce, Paulo Gomes, opened the last session of the 6th Forum of Africa Africa, on Thursday, November 23, 2018, highlighting the power of Agendas 2030 and 2063 for the development of an Africa stable and prosperous. He also took the opportunity to mention a project by the Ghanaian president, called “The Year of Return”. “In 2019, the president of Ghana wants to make ‘The Year of Return’. We are going to ask all Afro-descendants to return to Africa so that we can do business”, announced Gomes. The session, mediated by Bronwyn Nielsen, was also composed by Helder da Costa, General Secretary of the g7+; Azhari Gasim Ahmed, Lead Economist and Leader of the Resource Mobilization Team of the Islamic Solidarity Fund for Development (ISFD) and Georgina Benrós de Mello, Director General of the Community of Portuguese Speaking Countries (CPLP). Helder da Costa started the debate highlighting the importance of the 2030 Agenda from the point of view of the g7+ member countries. According to him, being part of South-South Cooperation is essential, especially if relations between countries are based on trust. “Our partnerships need to be done locally, regionally and globally. In this context, we were invited to come here [to the Brazil Africa Forum]. We need to find something in common for the benefit of people”. He believes that borders that hinder the mobility of people and services around the world should be eliminated. “If we want to increase the mobility of people, we must invest in people’s lives. People are marginalized in Africa. 80% of Africans are going to other countries and we need to talk about it”. Regarding cross-country partnerships, Azhari Gasim Ahmed argued that without them none of the desired goals is achieved. “The partnership is part of Agenda 2030. We need to create a commission to develop a sustainable partnership group because that is the principle of commitment among countries”. Still speaking of partnerships, Georgina Benrós de Mello mentioned the relationship between Portuguese-speaking countries, especially regarding economics and entrepreneurship. “Our countries have important economic relations. We are very connected by entrepreneurship. However, among us, community, less than 2% does in terms of community relations. The potential is immense, and we have a lot to do. It needs to develop the economic, productive apparatus. Improve the quality of our institutions, which are essential, and we are working on this” said the Director General of the Community of Portuguese Speaking Countries (CPLP).